General Information: Broccoleaf tastes like a sugar snap pea but looks a bit like kale. The leaves of broccoli plants are the newest superfood trend and for good reason. 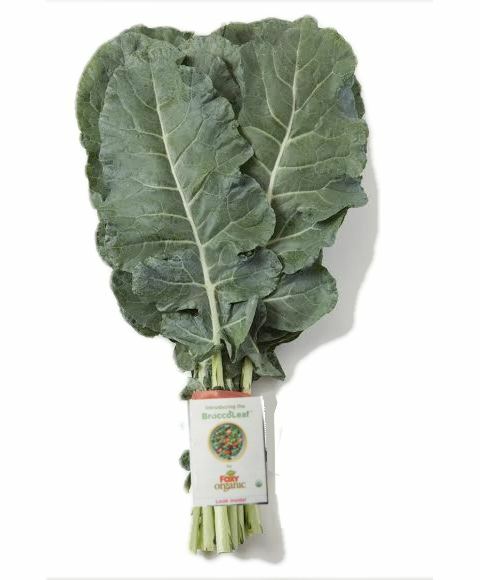 One Broccoleaf serving provides 100% of your daily value requirement for vitamin C, essential for immune health during this cold and flu season and tasty green provides more calcium than a serving of Kale. It is an excellent source of calcium and vitamin A and delivers your daily dose of vitamin C. Packed with folate: it is a good source of this key nutrient for heart health. Like all members of the Brassica family (cruciferous vegetables), the Broccoleaf is a powerful anti-cancer food. Glucosinolates and other antioxidants in BroccoLeafs work to protect your body cells from oxidative damage that can promote cancer. Glucosinolates are sulfur-containing antioxidants are used in the creation of specialized enzymes that support liver health and detoxification.